I have so much to update on but I'll begin this post with the good news! Today I had an appointment to look at the results from the CT scan I had on Monday...anyway, I walked in to the room and was taken back by how many people were there lol (11 altogether!!) - It was quite daunting with that amount of Doctors and specialists in there lol. Dr Tahir was there and said "Great news, the tumour has shrunk!!" - I was SO happy to hear that. I think I could of stood up and done a dance or something lol. So, they've decided that I will be having a 3rd cycle of chemotherapy before starting radiotherapy. I will be having that from the 28th of January, just to give it that extra kick in the arse. We then spoke about the radiotherapy briefly, Dr Tahir told me that I might not be able to swallow (therefore wont be able to eat) because of the position of the tumour and where the radiotherapy thingy mijigs will be shot at so I am having a feeding tube fitted (going in to my stomach). I think that's happening in February some time - it will be done under local anesthetic and possibly sedation so I'm glad I'm not going to be knocked out. It's going to be strange if I can't swallow! After we spoke for a while Dr Pace Balzan put the evil camera in my nose and down my throat (didn't feel it at all this time!!) and had a look, took a picture and then compared it to the picture of the tumour that was taken a while ago and the difference is amazing. GREAT NEWS. I'm so so so so happy!!!!!!!!!!!!!!!!!!!!!!!!!!!!!!!!!!!! Okay, other stuff to update about. I went to see the Spice Girls on Sunday the 13th, one word: AMAZING. Seriously...it was just so good. It was slightly frustrating that I couldn't cheer and sing along but I got over that after a while lol. I had a brilliant time and they were just fantastic fantastic fantastic. Thank you to the o2 arena staff for being so great and handling everything. Erm...my last cycle of chemo went okay. The first day was a bit of a hassle as my PICC Line decided to not work, it wasn't even letting anything IN so we worked out I had a blood clot in there. So, I had to have the first lot of drugs in a cannula in my other hand while they put this dissolving stuff in my PICC Line. It DID clear the clot, but I had this really bad pain in my chest so they figured that's where the clot most probably was. They scheduled an x ray for the Tuesday to see if it was in the right place and it was! When they started the first lot of chemotherapy drugs I had a reaction (All I seem to do is cause problems lol) - they literally hooked me up, my heart started racing and I could feel the blood boiling and rising to my head so I told the nurses, they disconnected me and then I was fine. It was really weird! Turns out my body had made antibodies to reject the chemo lol But they pumped me with some other stuff and then started the chemo again and then I was fine. Because of all that palaver I had to go in on Tuesday and Wednesday to get more chemotherapy and then it worked out that I missed some 5FU but they said that it doesn't matter so it's all good! I had some side effects but NOTHING compared to last time. Just felt tired, had weird eyes (Can't concentrate on anything), a bit of nausea and just feeling crappy - but I'm feeling great now. Hair loss chat - I am sporting some mega big bald patches now! Haha. I don't mind now though, I don't really think about it anymore. I wear bandanna's when I go out and it is annoying when people stare but what ever. I don't even think about losing my hair anymore to be honest, well, apart from when I look in the mirror. I have a little ponytail still and it feels like I could pull it and it would come out lol - I'm not sure if it'll all come out. My hair was so thick in the first place so maybe it'll just stay like this, I don't know. But I'm not bothered either way. 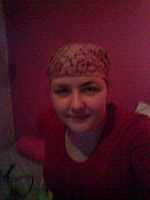 I have a sore scalp still, it seems to be in patches and it comes and goes...it's a bit sore today but not too bad. I think that's everything that I came to say! I know I should update more but I'm just plain lazy. And when I have chemo I don't really come on the internet (or do anything but sleep) for a couple of days so there's my excuse for a few of the days lol. I hope everyone is well, thank you so much for my comments. I can't actually reply to any of you but if you want to reply leave your email address and I'll email you when I have the time! 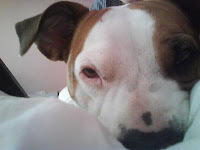 P.S - I love this picture of my dog, hehe. You have all my best wishes and prayers, I am so very happy about the news, Way to Go. P.S. The Spice Girls were bloody amazing!! I got a few teensy vids (mainly of my singing along out of tune and screaming LOL) but if you want them I'll bung them on a cd for you, no worries. hello hayley.. YAAAAAAAAAYYYYYYYYYYYYY!!! jodie says hayley fayley bom bayley fee fi fo fayley... /HAYLEY!!! YAY! :D congrats my little chicken poo. Fab news about the tumour shrinking, your so much closer now to kicking it's arse than you were when this all first started! Well done! Loved the photo's of the spice girls on facebook, especially those of you in your spice girls bandana :P. Glad to hear you were all treated like royalty, like it should be! Hehe! I'm so, so happy for you Hayley(yep I'm crying again LOL).That's just wonderful news sweetheart.You rock girly!!!! I'm really glad you got to see the Spice Girls, sounds like you had a great time. Take care Hayley and sleep tight. ... you're getting there daughter of mine! you look fabulous my dear....i mean that! take care and give your Mum a hug from me will ya?? You make me laugh always putting pictures of Bonnie on. You're bloody mum again makes me cry. I said I wasn't going to read her comments anymore but then I did and it always makes me cry everytime. Anyway, I love you and I can't wait till you can talk!!! PS Cups, sorry for calling you "bloody"
great news Hayley. really happy for you. and glad you enjoyed the Spice Girls. Thats fantastic news Hayley, I'm so happy for you and I don't even know you!! I'm glad you got to the concert in the end and had a great time. I love your funky bandana, yo! You are my hero and I am so pleased that things are heading in the right direction! Also heard that you are getting 4 more Spice Girls tickets too, that is brilliant news! Wonder if like Prince did, the Spice Girls will change their set list? FABULOUS news Hayley! You go girl and remember to keep kicking - HARD!!!!!! Hayley, I have been following your story both here and with you Mum on the OC message board. You give me strength to help my Dad going through the same thing. :) Hang in there! You are a fighter, I can tell. Now go kick some ARSE! I am so thrilled the tumor has shrunk!!!! So happy to read of your good news! Thats really good news Hayley, so pleased for you! I'm so glad the tumor is shrinking. That's awesome news!! Tell you mom I say hello! i'm pleased to hear about the cancer. I can't wait to actually talk to you. I've got a package i'll be sending out next week. Tell your mom it was great catching up. Hey hayley! Im mike aunty ginas brother. You are one brave girl and my and my familys hearts are with you. keep fighting and never give up.